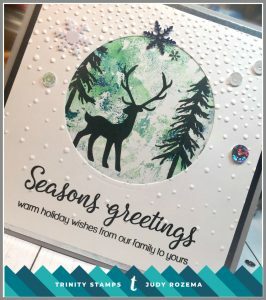 I love this new silhouette stamp set! I like to make monoprint backgrounds with acrylic paints, and this was a perfect opportunity to use Seasons Greetings! 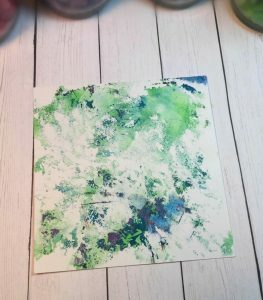 I started with one of my monoprints, made with a Gel Press plate for my background, and figured out where I wanted the “snow” and where I wanted the “trees”. I moved my stamps around the print for awhile, before I decided which direction to make “up.” Up is actually turned 90 degrees to the right from this photo. 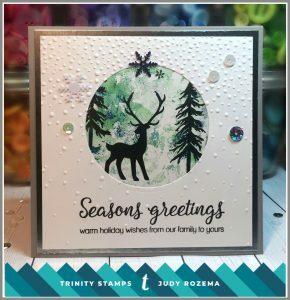 I stamped my images using my MISTI and VersaFine Onyx Black ink. The MISTI helps the ink adhere to the painted background. I then cut a frame for my little scene, using a Sizzix circle die, and stamped my sentiment below. I added texture to the frame with an embossing folder after the sentiment was dry. I added some sequins and snowflakes from the new Blizzard Shaker Embellishment Mix for some added bling. Thanks for stopping by today! You can find more of my projects at Joy in a JAR! Super pretty! You know I have a gelli plate I have never used! 😳 I think I might be inspired now! beautiful background! adds so much to the card!! This card is fantastic. Love it.